Almost 20 years after hearing this from an oboe teacher in graduate school, Keve Wilson is every bit an oboe player and plays on the current Broadway hit show, A Gentleman’s Guide to Love and Murder. It takes a pretty unique personality to hear a criticism like that and not be completely derailed. After meeting Keve in 2012, I soon began to realize what an inspiring, gifted and generous artist I was lucky enough to be spending time with. Keve is one of those people who lives in the moment and is truly herself both as a human and an artist. She creates opportunities for herself and for others with seeming ease. She has been hailed by the New York Times for her “magnificently sweet tone” and has played all over the world. Her repertoire spans the genres from pop to classical to Broadway to her favorite, Irish jigs. Her personality is warm and friendly with a kookiness that matches her mane of gorgeous blonde curly hair. Whenever I watch her play the oboe no matter the venue, I feel deeply that she is exactly where she is meant to be, doing exactly what she should be doing in that moment. She is truly herself. And her unique life and career embodies that sense of self. Ten years after hearing that awful statement from her professor, Keve got an orchestra gig performing in Germany from a flutist she had worked with. 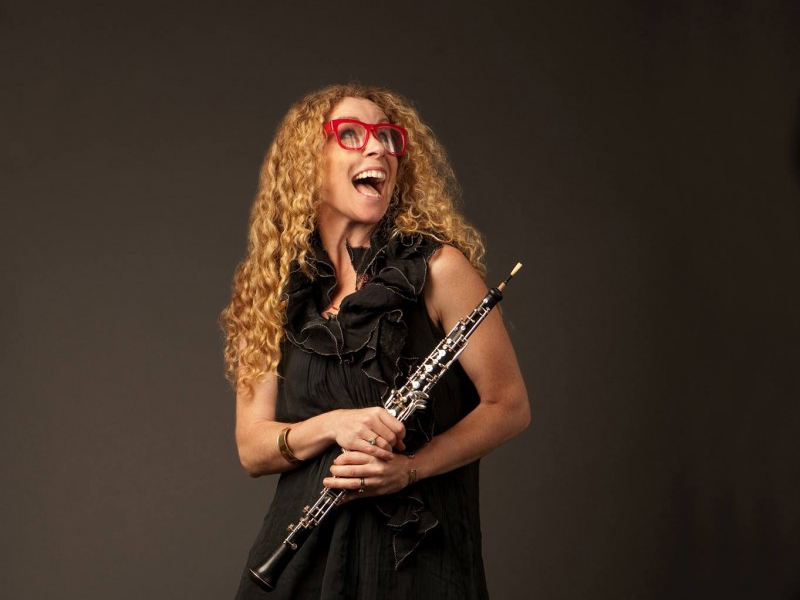 She was offered the opportunity to choose the second oboe player and it was suggested by the conductor that she reach out to that same professor she had had in graduate school. She was to ask him to recommend one of his students. Keve, trusting that 10 years and her career would speak for itself, made the call. Unfortunately, time hadn’t changed anything in her former professor’s eyes. He called the conductor and told him that Keve did not have the chops to play the piece. Since Keve had signed a contract, she couldn’t be fired, but she knew she would have to nail the piece including a large oboe solo. After the first concert in Germany the conductor received a huge bouquet of flowers from the people sponsoring the event. During the bows the conductor took the bouquet and handed it to Keve. Once again, she had proved herself. And, once again, she did not accept someone else’s imposed limitations for herself. She knew she could play it, and she did. Pressure was no match for her passion and joy in the music. Keve and I sat down for dinner last week and I asked her where she thinks her strong sense of self came from. The first thing that came to mind was her name. This is one of the many things Keve and I have in common. Having a unique, or, in my case uniquely spelled name can begin to shape who you are. It gave us both a sense of being different, apart from the crowd and unique. When you are constantly explaining your name as a kid, it’s no wonder you start to think of yourself as different from everyone else. The second answer she gave me was the influence from her parents. Her parents let her make her own decisions from a very young age. She spent her Saturdays in High School taking the train into New York to study at Manhattan School of Music. She says her parents also made her take responsibility for her actions from the beginning. As I’ve come to get to know her, I believe it was these two things and an undeniable passion for music that fueled the fire for becoming the artist she is today. I asked Keve what her goals are and what she hopes to accomplish next. Without hesitation, she replies, “An arena tour! I want to be the oboist that goes on tour with Lady Gaga!” I laugh a little at her certainty and because it wasn’t what I expected her to say at all. But a moment later I realize how right she is. This is exactly what she should do next, and from what I can see, Madison Square Garden better get ready. In addition to playing on A Gentleman’s Guide to Love and Murder, Keve Wilson performs her one-woman show, From The Band Room To The Orchestra Pit, for Believe NYC music students from around the world. Previous Previous post: Arts For Autism 2016 brings students to New York to perform on Broadway and support a great cause. Next Next post: Arts for Autism announces the Doo Wop Project to the Stage!